There are many live chat operator jobs from home that are open and actively seeking applicants! If you’re looking for text chat operator jobs from home, you’ll be pleased to find out that there are openings happening right now! One company that knows the importance of offering jobs at home is ModSquad. Not only do they recognize the importance, but they offer positions that are readily available for the general public as well. One job that they offer and have openings for consistently is their live chat operator jobs from home. If you’re interested to learn more about what this entails, read on about how you can find out if you qualify for this work from home job or not! If you’re intrigued by becoming a live chat operator, you’re not alone. This is one work from home job that can be a great entry level position into a great company. What are the duties of a live chat operator? Basically, to provide awesome customer service and support. You’ll need to be available during the hours you’re scheduled to be able to communicate and answer questions from customers. And while this sounds pretty great, it does get better! Anyone can apply to do this job from anywhere in the country as long as you have an internet connection and a dedicated space that you can work. What skill sets does a live chat operator job require? In order to be successful in your position as a live chat operator, you need to make certain that you have certain skillsets to thrive. Strong communication skills and superb listening skills top the list, but there are a couple of other ones to keep in mind, too. And while these aren’t all of the required and needed skill sets, there are some of the top ones that need to be on the front of your mind. Can I work other jobs besides the ones at Modsquad? Absolutely. This is just one more reason why people are applying to Modsquad. Many people actually do this position as an addition to their current full-time jobs to earn a bit of money. And as long as your outside job doesn’t trickle over and interfere with your schedule with Modsquad, it’s a viable option to have more than one job that you can do! Am I actually an employee of Modsquad? If you’re inquiring about wanting to become a live chat operator, you’re actually going to be applying to be a contractor instead of an employee. What this means is that you’ll still get help and training from the company, but when it comes to taxes, etc., you’ll be responsible for handling and dealing with that on your own. Being a contractor also means that you more than likely aren’t going to receive any types of benefits, either. So this is just something else to keep in mind before applying to this job. 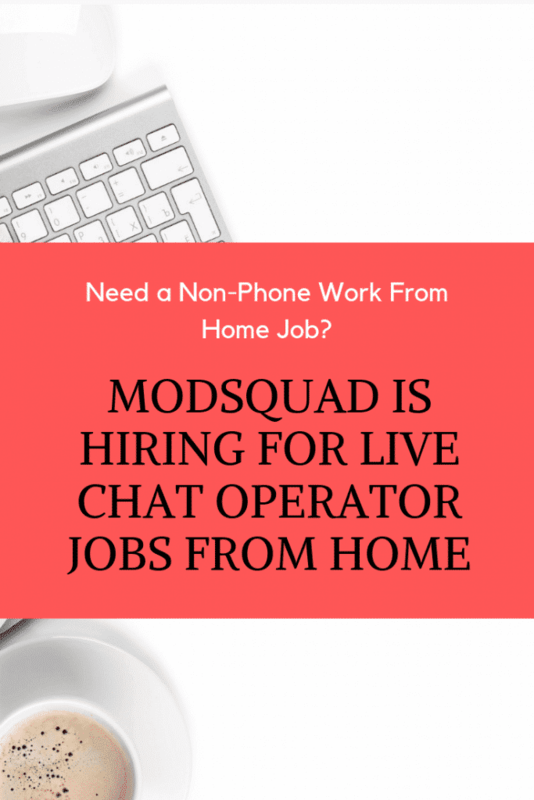 What is it like working live chat operator jobs from home with Modsquad? The payment structure varies from client to client due to length of project, skillset desired and services needed. You set your schedule. The automated system typically releases each project’s client schedules in advance on a monthly basis, and you’ll be given the chance to select what works for you. You’ll need a computer, secure internet access and a workspace that is private, secure and noiseless. Then each project has specific requirements for skills and equipment. If you’re looking for a work from home job that you can do with ease, this is the one for you. It’s a safe bet to say that every customer and every day will bring something new and different, depending on what you’re going to be dealing with. Take the time to apply on the Modsquad website and see what opportunities might be available for you to interview for. And remember…if you’re wanting to have a job that you can do remotely or from home, you have to put yourself out there and apply!